Newquay is the perfect base for discovering the rest of Cornwall. With its great range of accommodation and position it makes discovering all of Cornwall’s history, tradition and attractions a simple matter. You can’t come to Cornwall without seeing the Eden Project. Since it opened in 2001, Eden’s famous biomes have attracted visitors from around the world. It describes itself as ‘a living demonstration of regeneration’ and it tells the amazing story of man’s relationship with – and dependence on – plants. In the summer months, Eden also hosts a series of sell-out concerts. Read more about the Eden project here or visit their web site using the link below. Explore Cornish maritime history at The National Maritime Museum Cornwall, housed in an award-winning building on the harbour in Falmouth. There are fascinating exhibitions and interactive displays to keep the whole family involved. 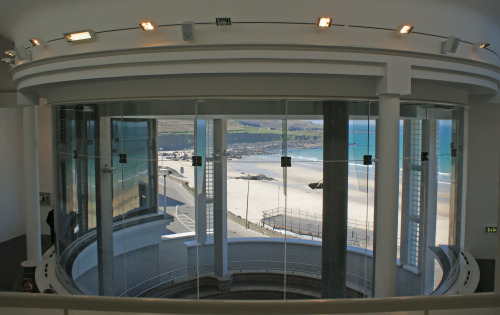 A stunning gallery overlooking the beach at St Ives, the Tate hosts exhibitions of modern and contemporary art, with a Cornish flavour. While you are in St Ives, you can also visit Barbara Hepworth’s hidden and atmospheric sculpture garden. Voted best tourist attraction in Cornwall, the National Seal Sanctuary at Gweek is Britain’s leading marine rescue centre. You can find it on the Helford Estuary and it is well worth a visit. For the ultimate day-out, why not take the car to Land’s End and fly to the sub-tropical paradise of St Mary’s, Tresco and the other Scilly Isles? Alternatively, see Cornwall’s most famous landmarks from a different angle, relaxing on a fully catered coastal cruise from Penzance. There is entertainment on board, and more on shore – most famously at the Minack, a Roman-style amphitheatre carved from the cliff-face and looking out over the blue Atlantic.